You never know when someone is going to see your car and think of it as their next target. There are thousands of break-ins every day. If you leave work one day or come out of your home to find your car broken into, what are you going to do? Is your auto insurance policy going to do anything about it? Are your things gone for good and you’re out of luck?? These are a lot of the questions we hear from clients about their car insurance policy. We want you to understand exactly what coverage your car insurance provides. To answer the question of “does my car insurance cover break-ins?” let’s go through a hypothetical situation. You go out to your car in the morning to leave for work. You’re shocked to see your windows are busted, and all of your stuff has been rifled through. You’re devastated. You call the cops, file the report, but now you’re not sure what to do next. Well, here is the thing. Your auto insurance company won’t replace anything which is stolen out of your car. If the thief grabbed your laptop, your car insurance would have nothing to do with that. Hopefully, this is where your homeowner’s insurance comes to the rescue. Depending on your policy (and most of them should), your home insurance or renter’s insurance will pay for you to replace the stolen goods if they were taken out of your driveway or garage. What about the damage to your car? Luckily, this is where your car insurance carrier will help. If your windows were broken into to steal your things, the insurance policy would pay to get them fixed. Similarly, if your locks are broken, or there is paint damage then you can file a claim, and it will be covered. While these might seem like minor damages, it can rack up some serious costs. Which brings us to one of the tips we give to clients who have had a car break-in. If your windows are broken, or you have some minor damages, don’t automatically file a claim. Yes, we know that’s weird to hear from insurance agents, but it’s the truth. Depending on your deductible, it could be most cost-efficient for you to pay to fix your windows out-of-pocket instead of paying the deductible. Take the time to get a quote or two before you file the claim. At Longevity Brokers, we not only want to help you get the most affordable and quality insurance coverage to protect your home and your car, but we also want to give you the knowledge to prevent those things from happening. 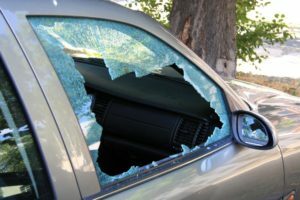 There is no way to completely guard yourself against having a car break-in (aside from not having a car), but there are some things you can do to decrease the chances. The first thing is obvious, lock your doors. Even if you’re going to be gone for a minute, always lock your doors. You would be surprised at how quickly a thief can get into your car, grab your things, and be gone. If the locks on your car are broken, get them fixed as soon as possible. It’s a small investment which can save you thousands of dollars and hours of frustration. Another simple thing you can do is to keep any valuables hidden in your car. If you keep jewelry, electronics, or clothes in your car, try and hide them in the back seat or under something else. You don’t want to give the thief any incentive. If it ever happens, there are going to be a million thoughts running through your head. It’s scary and emotional. The first thing you should always do is call the cops. In every situation, you should always call 911 as soon as possible. Additionally, don’t touch or move anything from your car. Your first impulse is going to be to look through your car and see what was taken, but don’t! Leave everything the way it is. After you’ve filed the report with the cop, and they have cleared you to get into your car, then you can see what has been taken. Take inventory of all the stuff. At first, you may not realize what has been stolen aside from the obvious. Once you’ve had time to take stock of your goods, then you can file any claims necessary. This might be with your homeowner’s insurance carrier or with your auto insurance company. Auto insurance and car break-ins are something we get a lot of questions about. Sadly, there are millions of thefts every year. At Longevity Brokers, we want to protect your car, your house, and much more. If you have any concerns about your auto insurance or homeowner’s insurance, let us know. We can give you quotes from dozens of companies. We pride ourselves on giving the best insurance protection in the Denver, Colorado area. There are two ways you can contact us, either through our contact page or a call at (720) 209-4598.